XML Schema is the new language standard from the W3C and the new foundation for defining data in Web-based systems. There is a wealth of information available about Schemas but very little understanding of how to use this highly formal specification for creating documents. Grasping the power of Schemas means going back to the basics of documents themselves, and the semantic rules, or grammars, that define them. Written for schema designers, system architects, programmers, and document authors, Modeling Business Objects with XML Schema guides you through understanding Schemas from the basic concepts, type systems, type derivation, inheritance, namespace handling, through advanced concepts in schema design. *Reviews basic XML syntax and the Schema recommendation in detail. *Builds a knowledge base model step by step (about jazz music) that is used throughout the book. *Discusses Schema design in large environments, best practice design patterns, and Schema's relation to object-oriented concepts. Part 1: The Model. Foundations; Conceptual Modeling; Everybody Likes Jazz. Part 2: The Implementation. XML Basics; XML Schema; Authoring XML Schema; Relax-NG; From Conceptual Model to Schema; Validation beyond XML Schema. Part 3: The Environment. Reality Check: The World is Object-Oriented; Reality Check: The World is Relational; Schema Evolution; Schemata in Large Environments. Berthold Daum holds a Ph.D. in mathematics and was a codeveloper of NATURAL 4GL at Software AG. He has lectured in database design at the University of Karlsruhe and has practical experience in the design and implementation of large distributed online systems. In the 1980s, he became involved in artificial intelligence and was a member of the ISO standardization committee for PROLOG. 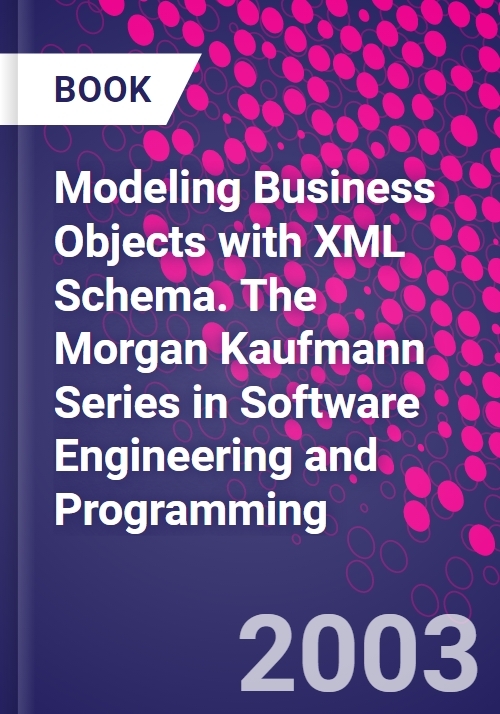 He has published various articles in trade magazines and scientific publications, and is co-author with Udo Merten of System Architecture with XML, and author of the forthcoming Modeling Business Objects with XML Schema. Currently he runs a consulting agency for industrial communication.